It is the season of giving thanks and telling the people around you how much they mean to you. In the days of texts and emails, there is something extra special about expressing your feelings in a beautiful handwritten note. BIC Mark-It® markers are a great choice for handwritten notes since they come in 36 beautiful colors, they are acid free and have virtually no odor. But what do you do if you have terrible handwriting? Your heartfelt declarations may be hard to decipher if your handwriting looks like chicken scratches. In this case I wanted to put a little note in my daughters’ lunch boxes, and I wanted them to be as girly and ‘fancy’ as possible, but I don’t have ANY calligraphy skills.. Well, have no fear! I have a super simple solution. 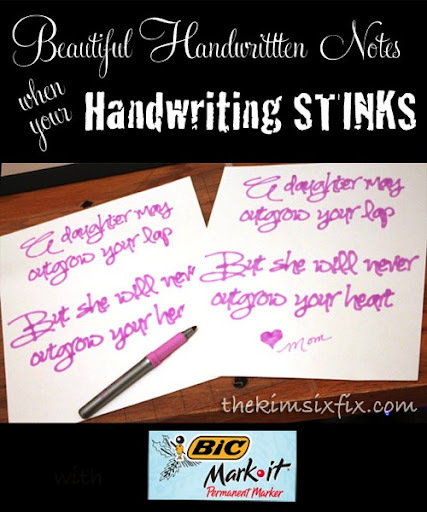 There is a way to have write with an actual BIC Mark-It® marker and still end with beautiful script text, even if you don’t have the skills! It is possible! I knew my die-cutting could cut out beautiful scripts, so why couldn’t it draw them for me? I would just replace the blade with my BIC Mark-It® marker. To accomplish this, I took an old dull blade and removed the metal knife. Then I popped out the ratcheted blade housing using a drill bit. I was left with the empty blade case which was basically a plastic tube. The Bic Mark-It® markers sit down into the empty blade case perfectly. To keep the pen from being pushed back out when pressed against the paper I added a rubber band around the finger grip area. For this note I chose the #PetalPink color since my girls love all things pink, but these markers come in 36 colors and in both fine and ultra fine tips (for a different look to "your" handwriting. You also could use any of the 8 metallic colors for even more sparkle. I slid the rubber-band wrapped pen into the blade case and made sure the tip was sticking out. The blade case fit into the blade holder on the machine like normal. Now I just had to tell it what to write. I ended up using the Simply-Glamorous font, since it was a thin line font. The other thing that was nice is that I could get exact duplicates (since I have two daughters.) That wouldn’t be possible if I had to write two copies. In this season of #BICMerryMarking I am challenging my mom, dad and father-in-law to write a note to their grandchildren and tell them what they mean to them. What would you say to your grandchildren if you knew they would remember those words forever? A beautiful heart-felt note can become a sentimental momento when it comes from someone you love, and I would love my children to have that gift. And now your family can participate in my challenge as well. You can get the booklet of merry marking and a coupon to start marking your own letters at home. You won’t regret telling someone how much they mean to you! Make sure you share your ideas using the #BICMerryMaking hashtag so we can all see them!